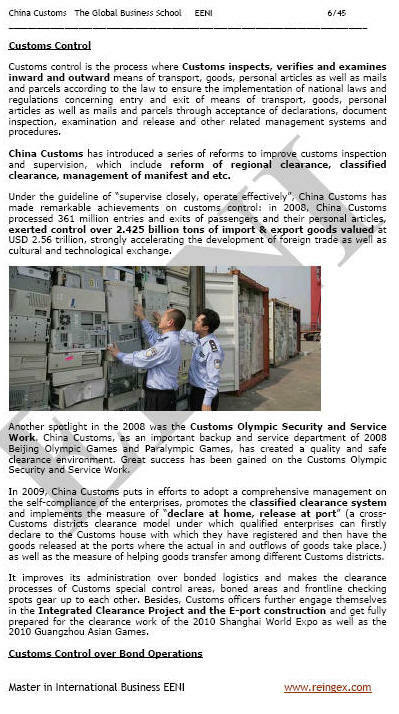 Syllabus of the Online Course (Subject): China Customs. Import/Export procedures. The main objective of China Customs (the Chinese public agency) is to supervise and manage international trade from the Customs territory of the Mainland China. China Customs have played a significant position in the conception and implementation of the import and export tariff schedule and preferential tax policies, CEPA (Closer Economic Partnership Arrangements with Hong Kong SAR and Macau SAR), negotiations on Free Trade Agreements, implementation of rules of origin, zero import tariff treatment for fruits originating from Taiwan Province, and other relevant policies and measures.